There is green on the screen this morning. Market sentiment is positive following a high-profile speech by the head of the U.S. Federal Reserve, Janet Yellen. 1. 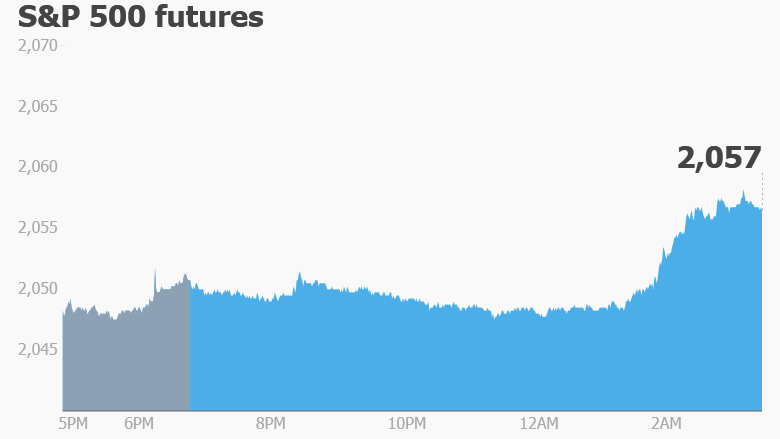 Ready for a rally: U.S. stock futures are rising and pretty much every global stock market is in positive territory on Wednesday. The rally was inspired by Yellen, who said on Tuesday afternoon that the Fed would "proceed cautiously" with future monetary policy moves, which suggests a lack of appetite for an interest rate hike in April. The speech caused the U.S. dollar to drop versus all major global currencies, and it continued to slump Wednesday. Meanwhile, the S&P 500 turned positive for the year and the Dow Jones industrial average rose 98 points to hit its highest closing level of 2016. The Nasdaq jumped by 1.7% on Tuesday as Netflix (NFLX), Yahoo (YHOO) and Apple (AAPL) surged. 2. Bad times in Brazil: Political concerns in Brazil are in focus after the country's largest political party announced Tuesday that it's pulling out of President Dilma Rousseff's coalition government. This is the latest development in a deepening political crisis. The threat of impeachment looms for Rousseff. The president's second term has been marred by a corruption scandal that has spurred mass protests, but Rousseff has denied the allegations. 3. Tough day in Tokyo: Shares in Takata, a Japanese auto parts maker, fell by 19.5% to close at a new low after Bloomberg reported the company expects a global airbag recall to cost as much as $24 billion. Millions of cars have been recalled for faulty Takata airbags that can shoot shrapnel into drivers' faces and necks. Takata's tough day put a drag on the Nikkei index in Tokyo, which closed with a 1.3% loss. On the economic side, new statistics confirmed that Japan's industrial production fell in February by the most since the 2011 tsunami. "The good news is that production likely normalized in March, suggesting that the recent production declines are unlikely to herald a deeper manufacturing recession," noted HSBC economist Izumi Devalier. 4. Let's make a deal: After weeks of uncertainty, Foxconn's planned takeover of struggling Japanese electronics firm Sharp will go ahead, the companies said, although at a significantly lower price than had previously been announced. Both firms are important suppliers for Apple. 5. Earnings and economics: Companies including Carnival (CCL) and Lululemon (LULU) will report earnings ahead of the open. Micron (MU) will report after the close. On the economic front, ADP will release its monthly employment report for March, giving investors a better idea about the latest employment trends in the U.S. The report will come out at 8:15 a.m. ET. The federal government will post its weekly update to U.S. crude inventories data at 10:30 a.m.